(ESPN NY) Tiki Barber hasn’t taken the football field yet in his comeback, but he’s already taking hits for making an analogy to Holocaust victim Anne Frank. The former New York Giants running back has been criticized in local media for making the analogy during an interview in this week’s Sports Illustrated. At one point in the article, Barber describes going into hiding with his girlfriend after his well-publicized breakup with his then-pregnant wife. Barber and his girlfriend ended up in the attic of the home of the player’s agent, Mark Lepselter. “Lep’s Jewish,” Barber told Sports Illustrated. “And it was like a reverse Anne Frank thing. Seriously dude? Nothing like a good Anne Frank joke! How did Tiki think this was appropriate? Did you think people we going to laugh about it? 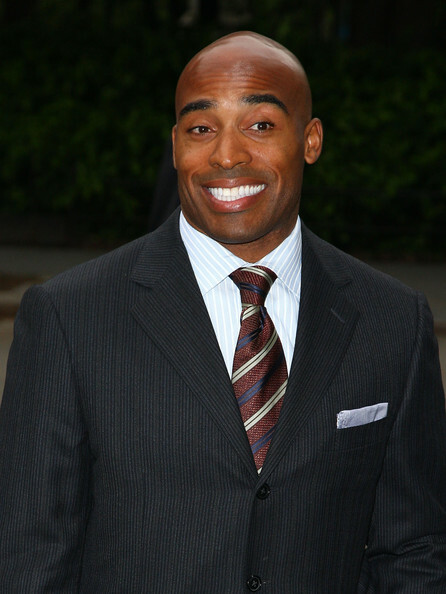 When Tiki Barber was a member of the Giants, I respected the hell out of him. He was one of the best runningbacks in the league and he had an unmatched work-ethic (squatting 800 pounds isn’t too shabby). But once he retired (in the middle of his prime), he became one of my most hated athletes on the planet. It wasn’t the fact that he quit on Tom Coughlin and his teammates in the middle of the 2006 season when he announced his retirement. But it was when he started criticizing Eli Manning and Coach Coughlin prior to the 2007 season. After that, I lost all respect for him. (On television, he claimed that Eli Manning wasn’t a leader in the locker room or on the field. He claimed his teammates didn’t believe in him). How dare you quit on the Giants then stab them in the back! I know he wanted to start his television career with a bang, but that’s just uncalled for. Seeing that Tiki isn’t a reporter anymore, I guess that move didn’t work out for him. But now with him leaving his pregnant wife for a 23 year-old, the entire country hates the guy. So when you are trying to win back the public, why would you say something this controversial? I’m actually starting to feel bad for him. I know he’s going to try and return to the NFL, which shows us that he realized he made the wrong decision to retire. If I were Tiki, I would try and stay out of the spotlight as long as I could. Just continue to get back in shape and pray that this lockout ends. This entry was posted on May 28, 2011 at 3:29 pm and is filed under Giants. You can follow any responses to this entry through the RSS 2.0 feed. You can leave a response, or trackback from your own site.